Neighborhood streets are littered with mangled mailboxes. No matter if it was a reckless driver, a villainous vandal or a pesky prankster, swapping out your letterbox can be an annoying affair. 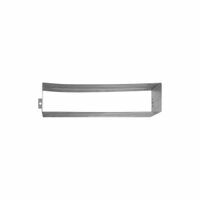 Remove the hassle and restore the flow of your letters by investing in our replacement parts for mailboxes. These items are perfect for the amateur handyman looking to find a quick, DIY solution. At Guy’s Hardware, we offer all the parts you need to give your mailbox a needed makeover. When you browse our inventory, you’ll find replacement flags, brackets, sleeves and much more. If your mailbox is beyond repair, choose one of our premade models—they come in a variety of sizes. Each box is crafted from durable, galvanized steel that will safely protect precious packages. If you’re searching for long-lasting mail and letterboxes online, you’ve come to the right place. Buy letterbox hardware in the convenience of your own home and have the parts shipped straight to your door. Shop now and get free shipping on orders $100+! Rust-resistant galvanized steel wall mount mailbox features a durable black powdered coat finish with an easy lift tab style lid. Includes a stylish embossed lettering feature on the front panel. Fully assembled. Mounting hardware sold separately. Size: 6.1"H x 15.2"W x 3.9"D. Locking galvanized steel wall mount mailbox with a durable, rust-resistant powder coat finish. This wall mount has a new contemporary designed lid that features a concealed cam lock with two keys to secure your incoming mail. Size: 10.1" H x 8.6" W x 4.1" D. Smooth rust resistant galvanized steel mailbox comes fully assembled with steel latch and aluminum flag. Medium capacity is standard in most households and can hold letters, magazines, padded mailers and small boxes. Size: 8.9"H x 6.9"W 20.1"D.
Smooth rust resistant galvanized steel mailbox comes fully assembled with steel latch and aluminum flag. Medium capacity is standard in most households and can hold letters, magazines, padded mailers and small boxes. Size: 8.9"H x 6.9"W 20.1"D. Wall mount mailbox is constructed of a durable polypropylene. Weather and rust resistant. Front panel has a classic decorative engraved design. Comes fully assembled. Size: 7.9"H x 15.5"W x 4.7"D. Wall mount mailbox is constructed of a durable polypropylene. Weather and rust resistant. Front panel has a classic decorative engraved design. Comes fully assembled. Size: 7.9"H x 15.5"W x 4.7"D.
Smooth rust resistant galvanized steel mailbox comes fully assembled with steel latch and aluminum flag. Medium capacity is standard in most households and can hold letters, magazines, padded mailers and small boxes. Size: 8.9"H x 6.9"W 20.1"D. Smooth rust resistant galvanized steel mailbox comes fully assembled with steel latch and aluminum flag. Medium capacity is standard in most households and can hold letters, magazines, padded mailers and small boxes. Size: 8.9"H x 6.9"W 20.1"D. Round post with decorative scrolls. Made from steel with a rust-resistant powder coated finish. Designed for in-ground installation with concrete. Recommended with standard size mailboxes. Size: 52.1"H x 6"W x 10.7"D.
Classic large, rural mailbox comes fully assembled with steel latch and aluminum flag. Large capacity can hold several pieces of mail and small parcel. Smooth rust resistant powder coat finish. Size: 10.9"H x 8.7"W x 22.6"D. Rustproof polypropylene plastic resists impacts and all types of weather while providing outstanding service. The mailbox body incorporates a ribbed design on top and textured side panels. Medium size holds magazines, padded mailers and small boxes. Comes fully assembled. Size: 9.8" H x 7.9" W x 20.4" D. Classic large, rural mailbox comes fully assembled with steel latch and aluminum flag. Large capacity can hold several pieces of mail and small parcel. Smooth rust resistant powder coat finish. Size: 10.9"H x 8.7"W x 22.6"D.
Classic large, rural mailbox comes fully assembled with steel latch and aluminum flag. Large capacity can hold several pieces of mail and small parcel. Smooth rust resistant powder coat finish. Size: 10.9"H x 8.7"W x 22.6"D. Flap and back plate included. Size: 10"W. Flap and hood plate.13"W x 3"H.
Rustproof polypropylene plastic construction provides durability while the ribbed body adds strength. Incoming mail flag notifies homeowners of deliveries. Wide, large opening easily holds small packages along with daily mail. Size: 9.5"H x 12.4"W x 21.3"D. Lockable wall mount mailbox constructed from rust-resistant galvanized steel and has a durable powder coat finish. For security this mailbox has a concealed cam lock and comes with two keys. Its medium capacity can hold magazines and large envelopes. Optional decorative emblem included. Size: 12.6" H x 9.7" W x 4.4" D. Mounting hardware sold separately. Lockable wall mount mailbox constructed from rust-resistant galvanized steel and has a durable powder coat finish. For security this mailbox has a concealed cam lock and comes with two keys. Its medium capacity can hold magazines and large envelopes. Optional decorative emblem included. Size: 12.6" H x 9.7" W x 4.4" D. Mounting hardware sold separately. Lockable wall mount mailbox constructed from rust-resistant galvanized steel and has a durable powder coat finish. For security this mailbox has a concealed cam lock and comes with two keys. Its medium capacity can hold magazines and large envelopes. Optional decorative emblem included. Size: 12.6" H x 9.7" W x 4.4" D. Mounting hardware sold separately. Standard post. Grade #1 Southern Yellow Pine. Prowood Micro CA mold inhibitor. Pre-assembled for easy set-up. 4" x 4" wood construction. Size: 72"H x 4"W x 4"D. Medium wall mount mailbox is constructed of heavy-duty galvanized steel with a textured finish. Fully assembled. Mounting hardware sold separately. Size: 9.8" H x 16.6" W x 4.5" D.